<– Click on the photo for a larger version. 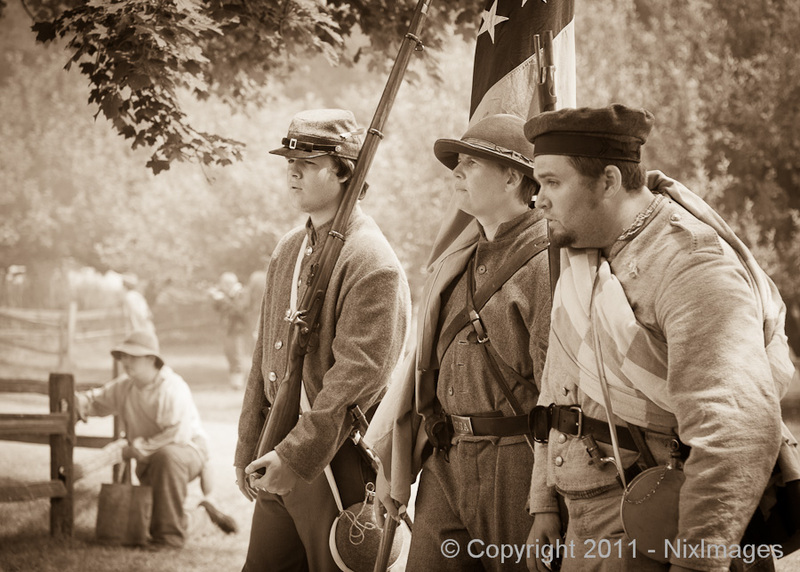 I decided to venture out to the Genesee Country Village and Museum to take in the Civil War Reenactment on July 9th and 10th. It was a great day for photography and I was not alone in capturing the moment. It also gave me a chance to try out my new ThinkTank photo gear. I’m a firm believer in wearing your gear as opposed to carrying it and while I saw many photographers slipping out of their backpacks to access additional lenses, mine were literally at my fingertips. I recently purchased a Steroid Speed Belt to replace my Tamrac version and it is awesome. I also picked up a Pixel Racing Harness to keep the speed belt firmly around my waist and distribute the weight of the equipment, and a Lens Changer 75 Pop Down to securely store my Canon 70-200 f/2.8L IS lens. The nice thing about the ThinkTank belt system is that I can incorporate my Tamrac Modular components onto this belt, so it’s not like I have to throw anything away, but the belt and harness are way better than the Tamrac version. If you’re interested, I posted some of the photos from the day’s shoot at the following site for your enjoyment. If you decide to visit please leave a comment, either positive or negative, I enjoy the positive and learn from the negative.